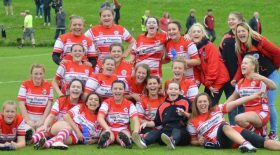 And they followed her advice gloriously in the first half, as they posted four unanswered tries on the scoreboard; enough to take your breath away. 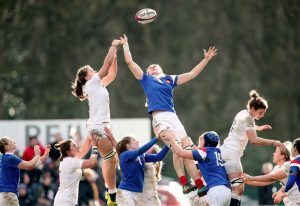 And it might have been five, only an initial majestic move which saw Sarah McKenna sweep over the line fell foul of the TMO. He had spotted a French forward being held fast by an English one as the move developed. No try. France threatened dangerous attacks, but couldn’t at this early stage keep the momentum going. Handling was fallible and thunderous tackles were going in; yardage was being conceded most unwillingly. The Red Roses even nicked a scrum against the head on their own 5-metre line, and Kelly Smith took the ball to safety on the 22. 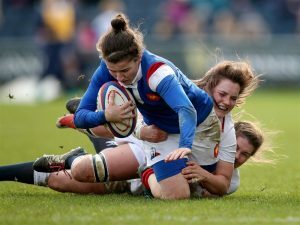 Pauline Bourdon was the heart of every French attack – there is a player in the running for Player of the Tournament, if not one stage better. All three of France’s greatest forwards, Lénaïg Corson, Safi N’Diaye and Romane Ménager, made threatening runs, but all were halted before they could do irreparable damage. Professionalism certainly seems to have sharpened the defensive qualities of the host squad. To complete a devastating 40 minutes, the Roses indulged in a complex handling move which left McKenna handing on to Breach for her second of the day. 4 caps, 14 tries. I need more fingers. The tackling had been brutal throughout. Only Vickii Cornborough was sent to the bin for a high tackle. 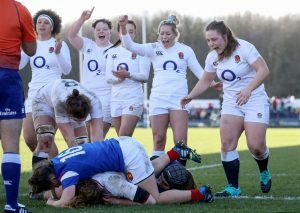 During her absence the Roses coolly scored two tries! Oh ye of little faith! Five more minutes and Leanne Riley (pictured above) made her first break of the day. It took the defence so by surprise that she wasn’t hauled down till she could smell the whitewash. But a try remained just beyond reach. The English tactics were based broadly on quick ball to the backs or forward rumbles and blends of the two. The kicking too was varied and telling. But it would be nice to see Riley mix her game up with the occasional box-kick or snipe on her own, as here. 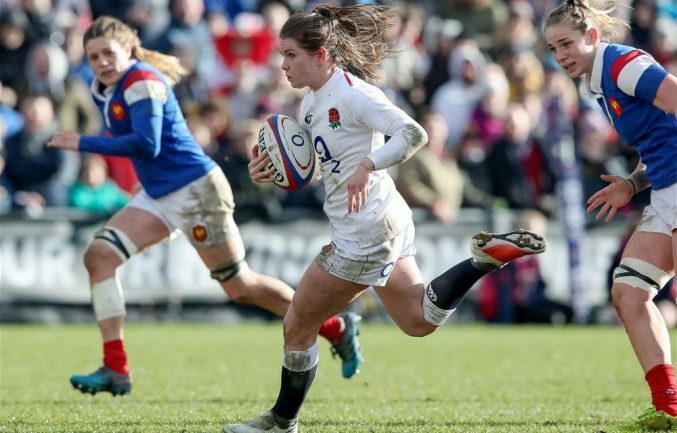 And before Tim Baker could blow the final whistle, Romane Ménager got her just deserts with a fourth (and bonus-winning) try. The shape of the game bears an uncanny resemblance to the England-USA pool game in the World Cup. There the Roses romped onto a 47-26 win after leading 33-7 at the break. In neither game could they maintain their defensive wall in the last quarter; the enemy crossed multiple times. England won’t be happy at conceding 26 points. This was a quite splendid match, played at a furious pace. Any ex-player looking on must surely have marvelled at the fitness and skills displayed by both sides. Only one other nation in the world can match their current standards. For the Red Roses, this was a triumph. Simon Middleton admitted afterwards he thought his side’s performance was outstanding. He was delighted with the physicality and proficiency on view. There was some looseness around the scrums and rucks but that can be sorted out. He reserved special praise for the backs who showed remarkable cohesion and penetration. Individual players are widening their skill-sets before his eyes. Neither he nor his captain was willing to say ‘Job done; that’s the Grand Slam sorted’, but their smiles said it for them. The prize must go to the try that wasn’t. Not England’s, but Wales’. In the tightest of tight games, Elinor Snowsill took the ball going right; she spotted Jaz Joyce out wide on her own 22, and apparently covered. She threw an overhead pass, Joyce took it, fended one, then another defender and was off. From the touchline, she swerved infield, harried by the hounds of hell. She escaped the last attempt at a tap-tackle and was over, under the posts. The Welsh girls whooped. In a game of the narrowest of margins (one penalty each) this was a devastating blow to take.